If you’re in the habit of carrying your camera gear with you when you go on a vacation, you need a camera backpack for it. And no, you can’t just carry in your regular backpack as it can damage your expensive DSLR. A camera backpack protects your camera, lenses, tripod, and accessories and makes it easy to carry and manage. You certainly need the best backpack for camera and hiking when you are out there in the mountain terrain. In this post, we are going to talk about the best backpacks to buy for hiking and photography. Personally, I suggest buying a sturdy backpack for your camera instead of a shoulder camera bag (that normally comes when you purchase a DSLR). A camera backpack is much easier to carry as it has two shoulder straps. It always balances the weight of the gear when the bag is on your back. You will find a wide range of DSLR backpacks online but we have done the research for you after going through tons of customer reviews and product specifications and shortlisted the best backpacks for hiking and photography. What to consider before buying a backpack for your DSLR. Sturdiness: How well the camera backpack will protect your camera gear and how much weight it can bear. Storage: How much gear you can store in the camera backpack. Comfort: Will you be comfortable to carry this camera backpack for a long duration or when you are trekking/hiking in the Himalayas. Accessibility: How easy it is to use and access your gear inside the backpack. Separate Sleeve for 17'' Laptop, Rain Cover for Heavy Rain. Front Accessory Organizer Pockets, Side Cargo Pockets for Accessories. This camera backpack is our best choice as it gives you everything you want in a great backpack at a reasonable price. There are many other camera backpacks that are great but costs upward of 10,000, while this one is well below that. The Tonba Camera backpack TB669 is a strong, heavy-duty backpack for your photography gear. This bag is especially recommended for people who carry a lot of camera accessories when traveling. It can accommodate 1 DSLR camera, 5-6 lenses, GoPro, GoPro accessories, your laptop, and chargers. Holds Large Video Camera such as Canon, Nikon, RED, Sony, Panasonic etc. A super heavy duty bag to keep your camera and gear very very safe. Believe me, this bag is one of the most solid backpacks you will ever see. The material of the bag is completely waterproof so you don’t need to worry if it starts raining when you are carrying your expensive gear. The Tonba TB669 has an amazing space and well-cushioned compartment to keep your laptop safely. The front zipper will give you access to the laptop and the second zipper on the front gives you access to the camera and its gear. The bag has two big side pockets and a small hook at the front for the tripod. The size of the bag is just right, the design is simple and intelligent to keep your gear well arranged. Believe me, the bag is as big as it can get and you will be able to store all of your gear in this bag. The backpack is very comfortable to carry on the shoulders and there is also a strong waist belt for better grip and comfort. 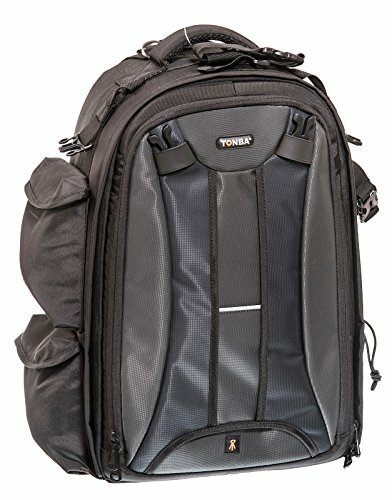 If you carry a lot of gear on your trips that includes a DSLR, 5-6 lenses, tripod, GoPro camera, laptop, and other accessories then this backpack is the right choice for you. The backpack is a bit heavier than the Lowepro Protactic 450AW. To be honest, this is a wonderful camera backpack and should have been my first choice, but the reason I rate this as second is due to its price. If you don’t mind spending what this backpack asks for, trust me, it will not disappoint you. The Lowepro AW 450 comes on top when it comes to protection of your camera and gear. The exterior of this pack is made from water-resistant and moisture resistant fabric. Therefore you do not have to worry about rain as long as it is not exposed to too much water. The interior inserts are padded and give you the ability to change their set-up anyway that you prefer. 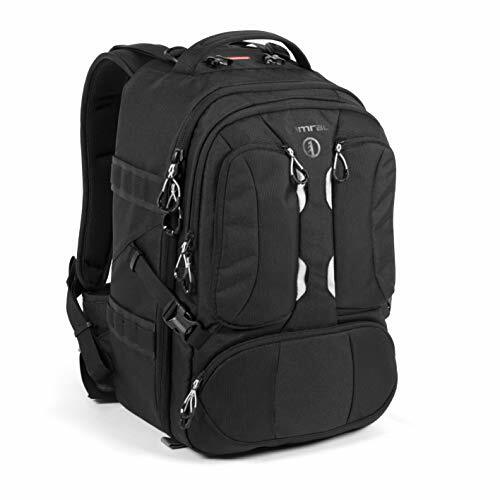 There are four access points in this Camera backpack to access your Camera and gear. You can open the backpack from either Left, Right, Top or back side to access the full gear. You will be able to fit 1-2 professional DSLR, lens, tripod, accessories and most importantly a laptop in a separate compartment. On the back panel, they have an active suspension made up of perfectly molded EVA to provide comfort and maximize breathability. The protactic 450AW also has a removable hip belt to provide an extra support when you need it. 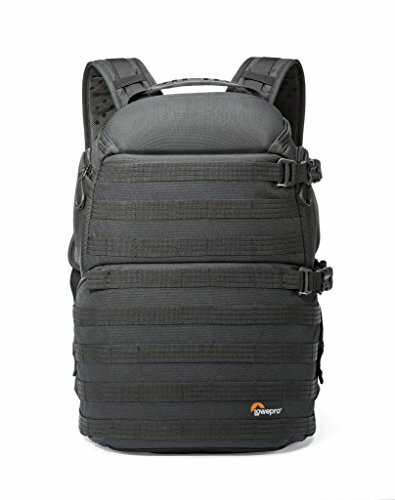 If you’re looking for a great camera backpack for a long-term duration then Lowepro Protactic 450AW is what we recommend. This might be a little expensive but considering this backpack gives full protection to your expensive DSLR and other gear, it is well worth a deal. Tamrac, Inc. is an American-based manufacturer of photographic equipment bags and backpacks. Established in 1977 by a group of amateur photographers who enjoyed nature photography, Tamrac is based in Chatsworth, California and has 200 employees. Tamrac’s founders were outdoor enthusiasts who loved nature photography. They, like many amateur and professional photographers, had a strong need for camera bags that were tough enough to offer excellent protection, yet were easy to carry and allowed fast access to camera equipment to capture spontaneous wildlife pictures. The Tamrac Anvil 23 offers plenty of protection for your camera and laptop. On the interior of the pack, there is a selection of flexible walls and removable shelves that allow you to change the interior layout depending on what you are carrying with you. It is very durable, well-suited for traveling with and offers plenty of protection to help keep your photography gear safe when you’re out and about. With the help of two small horizontal pockets and one vertical pocket on the front the bag provides easy access to small items in case it’s required. There is a separate compartment and zipper for the laptop. For quick access to the camera, there is a separate compartment with a zipper. Exterior pockets are handy for storing items such as sunglasses, mobile phones, maps, wallet, and other necessities. Side compression straps are useful for keeping your gear free from excessive movement. The Anvil 23 Backpack comes with the padded, grab handle or shoulder harness. For comfort and stability, the harness features padded, adjustable shoulder straps with a connector. On longer journeys, photographers will appreciate the added comfort provided by the removable hip belt. Both the hip belt and the side of the pack have M.O.L.L.E System attachment points. There is also a rain cover provided that you can use in the event of a bad weather. The main compartment of this bag features padded, touch fastening dividers for storing and organizing your pro-sized DSLRs with attached lenses, extra lenses, and accessories. Opposite your stored camera gear is three interior, zippered, clear, accessory pockets. A zippered, exterior, padded, front compartment has an inner sleeve for storing and protecting an up to 15″ laptop or another device. Exterior pockets are handy for storing items such as sunglasses, mobile phones, maps, wallet, and other necessities. Side compression straps are useful for keeping your gear free from excessive movement. The Anvil 23 is a gorgeous bag that is 100% recommended for people who do long trips and carry a lot of gear with them. The Tamrac is a little heavier than the usual bag at around 1.9 Kgs and that’s because it is made up of tough material to provide extra protection against the rugged terrain.